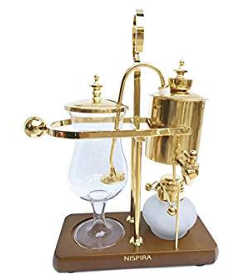 Almost everyone has an automatic drip coffee maker, and not many of them are satisfactory because they mostly fail to heat the water hot enough. Water must be just off the boil, 204-210F. Most mass market drip coffee makers heat water to only around 185F. (There are two on the market now that do a good job of drip, the Bonavita and the Technivorm. These cost roughly $150 and $300, respectively, but I think they are worth it.) Coffee should be ground to a medium grind. If you use a paper filter, wet it first to get rid of any paper taste. Measure the grounds at 2/3 to 1 scoop* per 1 5oz cup, e.g., 8 scoops for a 10-cup drip pot. If it is too strong, you can add hot water to taste. Please note that a light roast takes slightly more ground coffee than dark roast, but it will take some practice to find the exact amount that suits you. Drip coffee makers must be cleaned and descaled to remove lime deposits every 1-2 months. This in itself will make a big difference in taste. For further reading on this topic, the definitive article, in my opinion, is by the venerable Tom Owens of SweetMarias.com, one of my coffee heroes. Read his advice on brewing by drip here. 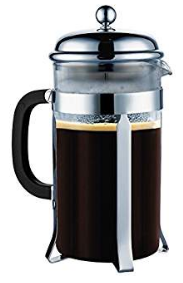 French press pots (aka, caffeteire, plunger) like the ubiquitous Bodum are widely available for under $50 in 3-cup, 8-cup and 12-cup sizes. 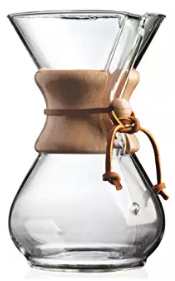 An immersion method, they brew coffee by mixing coarse-ground coffee with water just off the boil (200-210F-ish) for an interval of time (4 minutes). Then the plunger is depressed to separate the grounds from the coffee, and the luscious liquor is then slowly decanted into the cup. There is a sense of elegance in using a french press pot, and the coffee is full of flavor, body and some extra sediment, too. To make french press coffee, grind and measure 11 grams per 5-oz cup into the pot, slowly pour water just off the boil over the grounds, allowing for “bloom”. You can stir once to ensure all the extra CO2 is released. Then place the lid on the pot with the plunger in the UP position. Time the brew for 4 minutes. Decant slowly to minimize the extra sludge in your cup. Some baristas take off the lid and scoop the floating grounds off the top before plunging, but this seems redundant. If you are not going to allow the brew to sit on the grounds for any length of time, why bother? When NOT to use a French Press French press pots are especially good for brewing dark and most medium roasts. Light roasts and those with extra acidity, such as East Africans, are perhaps best avoided, as the french press method tends to accentuate acidity and brightness. A bright coffee might be made too bright to be at its best using this method. For all coffees made in a french press pot, it is important not to keep the coffee in the pot longer than 4 minutes as the extraction process continues even after the plunger is pushed down and it will become bitter if left too long. Decant into a thermal carafe until consumed. Better yet, only make what you intend to drink in the next 20 minutes. As with the french press, the coffee is ground medium to slightly coarse to prevent over-extraction, but since contact time is already limited by the method, it’s important to dial in your grind to make sure the coffee and water have the right amount of time together–not too fine, not too coarse. Pour over methods are optimal brewing techniques for light and medium roasts, especially very acidic coffees like Kenyans and those with delicate, less intense flavor profiles (dry process Ethiopia Yirgacheffe, most medium roast Central Americans, for example). Complex flavor coffees generally shine when prepared using a pour over method, unless you are using a dark, dark roast. While your mileage may vary, I have found that using this method with very dark roasts leaves something missing, especially if a paper filter is used. I would use an immersion method with those. In making espresso, the steam creates “crema” or foam on the top of the shot that has become a desirable aspect of espresso culture. However, some great coffees do not create crema when made by espresso method. They would be considered faulty for that application, when in fact, they taste great even without the crema. As Schulman notes, espresso method is great for low-grown, low-acid, “soft” beans that are dark-roasted, but it doesn’t generally do justice to the magnificent high-grown, dense, high-acid specialty coffees from such places as Kenya, for example. Espresso is proof that we need several methods of brewing coffee. 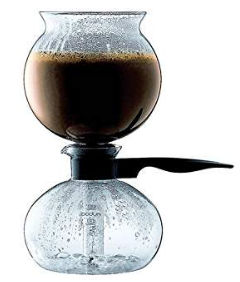 Over the years, many inventive people have sought new and exciting ways to make coffee, from simple “cowboy coffee” using nothing more than water boiling over the campfire and coffee grounds, to the Yama Vacuum Brewer, a Rube Goldberg device but fun and elegant if ever there was one, or its twin, the Bodum Santos. Vacuum and siphon coffee makers are stovetop models or use an open flame (very dramatic and sciency, also very delicious for those who want a pristine clean flavor profile). I blogged about the Hario vacuum brewer here and included some pictures. When I want the coffee origin profile to come into crystal-clear focus, I use a vacuum brewer. The Turks use an Ibrik to make a very thick, strong version of coffee, too. By the way, a Keurig is a drip coffee maker, customized for easy, single-serve use. (I hardly want to mention it because it makes terrible coffee due to low-temperature water, among other things.) One very different approach is cold brewing, where the water is not hot, and the coffee extracts over many hours. I blogged about this here. Ok, you have brewed your coffee, but something isn’t right. 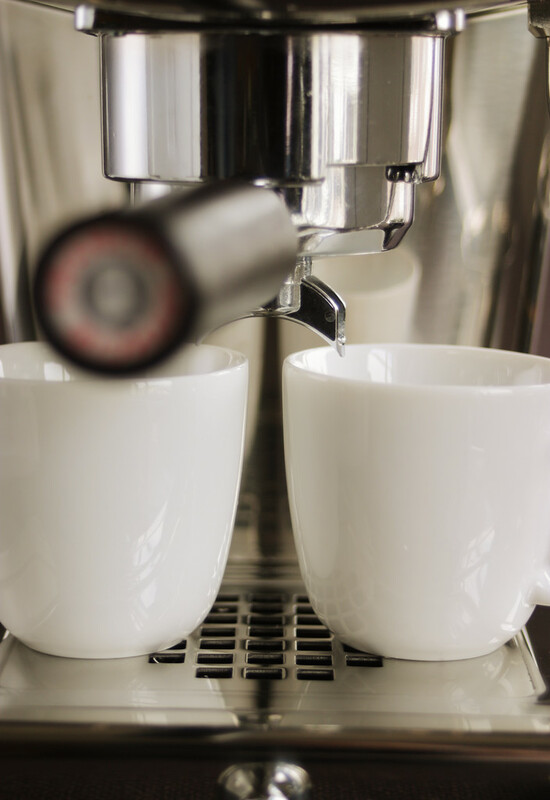 Troubleshoot your coffee-making process here.